The phrase “Newcastle solar power” is not one that would readily spring to mind. At first glance, Newcastle, Australia’s coal capital, doesn’t seem to be particularly fertile ground for solar energy. However, as coal is becoming more unfashionable, Newcastle and the Hunter region are beginning to exploit abundant sunshine and rooftops to make electricity from the sun via solar panels. According to Photovoltaic Institute data, approximately 13% of eligible dwellings in the Newcastle local government area have solar panels installed. The following Australian Photovoltaic Institute (APVI) map indicates the percentage of households with rooftop solar power systems in the region as at July, 2017. This ratio of solar panel installation is lower than other parts of Australia, which is about 23% overall. Perhaps Newcastle’s traditional role as the heart of NSW’s coal powered electricity generation industry has something to do with that. Newcastle’s association with coal began in the early years of Australian colonisation. In 1799, coal was mined in the area and transported back to England. Coal from Newcastle was Australia’s first export industry. Newcastle is now the world’s biggest coal export port. In the YTD at August 2017, 106 million tonnes of coal had passed through the port, with a trade value of $12.9 billion. The total trade value of coal in 2016 was $15.3 billion. 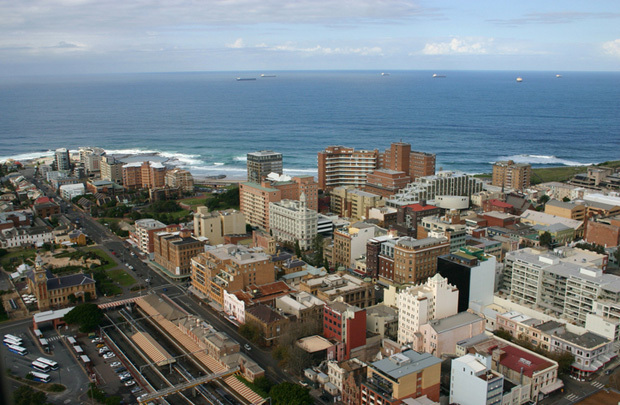 Newcastle, in its form as the Newcastle Statistical District, is the seventh largest city in Australia. This district includes well beyond both the City of Newcastle and the Newcastle metropolitan area. The area, also known as Greater Newcastle or the Lower Hunter Region, includes most parts of the Newcastle, Lake Macquarie, Cessnock, Maitland and Port Stephens local government areas, and has an estimated population close to 600,000 people according to the latest figures. Despite their proximity, all of the LGAs in the region maintain their own individual identities, separate from Newcastle. The city of Newcastle remains the hub for most services in the region. The City of Newcastle has been a leader in embracing clean solar energy as an alternative to its home grown and dirtier source of power. For example, with the Newcastle City Library, after undergoing a major lighting upgrade, a solar photovoltaic (PV) system was identified as a significant way to further decrease grid-sourced electricity and the costs associated with powering the library. An 86.25 kW solar system was installed in March 2015, resulting in a 13.5% p.a. reduction in grid electricity use at the time of installation according to City officials. This brings the total amount of solar PV installed on Newcastle Council-owned buildings to 442 kW. In addition, a small-scale (2.5 kW) wind turbine is in operation at the Summerhill Waste Management Centre. The uptake of solar panels in Newcastle in recent years has accelerated. The popularity of PV (photovoltaics) in NSW’s second largest city is largely due to the falling cost of solar panels, the Hunter’s high level of sunshine and favourable climate, attractive subsidies (that are available Australia wide) and the increasing price of electricity. A 5.2kW solar power system installed in Newcastle, as in other parts of NSW can return a financial benefit of up to approximately $2,000 a year; however it’s important to note financial gains, if any, will vary depending on the installation circumstances and the way power is consumed by a household. By also adding battery energy storage, households in Newcastle can reduce their mains grid electricity consumption by up to 80% and make the most of their rooftop-generated energy. As with the financial benefits of installing solar panels without storage; this figure will vary according to circumstances. You can get a rough idea of the impact energy storage can have using our solar + battery calculator. Tesla, Sonnen and Enphase are highly regarded solar battery manufacturers. The following is an example of an estimate involving a household consuming 16kWh of electricity a day – bear in mind the above applies; i.e., this is just an approximation and your own situation will likely vary. This is for a 5kW solar panel installation, with a Sonnen 4kWh battery. With an 8kWh battery, you would find that you get close to 80% of energy independence. Subsidies for the installation of solar panels in Newcastle and its suburbs are the same as throughout Australia. The major subsidy is the Solar Credits scheme, which is based on certificates (STCs) that are used (in most cases) to gain a point of sale discount that can be thousands of dollars, depending on the size of the PV system. In addition to this subsidy; Newcastle solar power system owners can also take advantage of feed-in tariffs, which currently pay 13 cents per kilowatt hour for all surplus electricity exported to the mains grid. On average, Newcastle’s Central Business District receives solar irradiation levels of around 4.44 kilowatt hours per square metre daily; making it an ideal area for installing PV modules – and it’s a similar story throughout much of the metropolitan area. These figures are according to Energy Matters, based on historical weather and climate data based on BOM weather station closest to the chosen location. Ideally, solar panels installed in Newcastle should face a northerly direction, but east/west splits are becoming more commonplace. An acceptable panel angle range is 17° to 27°, with the optimal angle being 22°. On typical rooftop PV installations, actual installation angle will be determined by roof inclination. As mentioned above, Newcastle receives solar irradiation levels of around 4.44 kilowatt hours per square metre daily on the average. The following is estimated daily output, averaged over a year (optimal configuration). Note that solar panels are not 100% efficient, hence the different output compared to the sun’s input. The best month for electricity generation from solar panels in Newcastle is December. If you’re curious about how many solar panel systems are in specific Newcastle and Hunter suburbs and towns, and how they perform, here’s a selection of links for those Newcastle suburbs. 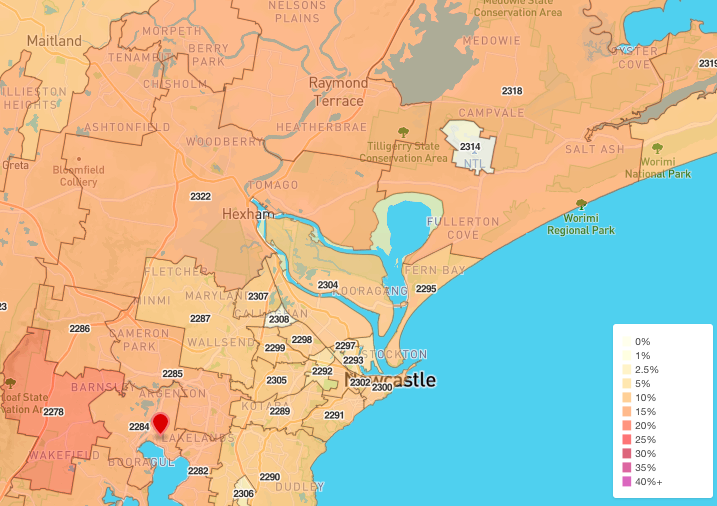 Energy Matters has a series of location pages, if you need to find your locality, then just use the solar location page for other suburbs in Newcastle, you can run a search here. 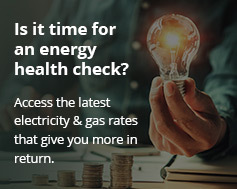 Wherever you are in Newcastle or the Hunter region, we can help you go solar and slash your electricity bills. If you’re also interested in boosting your energy independence with a battery system, we can assist there too. Energy Matters is an award-winning company that has been installing solar panels and battery storage across the country for more than a decade. Contact our friendly experts on 133-SUN for an obligation-free chat or submit for a quick solar quote. 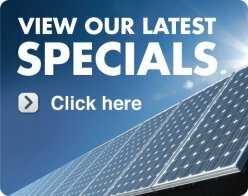 If you’re in the NSW check out our specials on solar panels in Newcastle.